Buy Mountain Ash Autumn Spire (Sorbus aucuparia `Autumn Spire`) online. 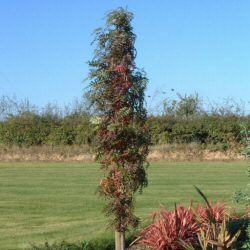 This rather unusual mountain ash is ideal for a small garden, in that its columnar form means it is not going to take up much space. Masses of yellow berries with red centres during later summer and into autumn are of particular appeal. These compliment the attractive fiery yellow-red autumn leaf display. Autumn Spire is a variant of Joseph Rock Mountain Ash. A small tree, so expect a height of up to 4m (13ft) after 20 years. Autum Spire is supplied at a height of between 1.5m (5ft ) and 1.8m (6ft) in a 12L container, which means that the tree has an already established root system and therefore this tree can be planted any time of the year and with better results than either bare-root or rootballed trees.